Coupon based redemption include any reward that involves giving the customer a coupon code in return for available points. Important Note: The codes have to be generated in your platform ahead of time and uploaded to the redemption option. These codes have to be valid on your platform. Zinrelo will simply dispense the codes to the customers who redeem that reward. 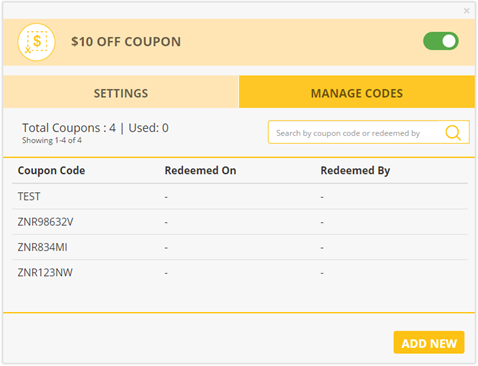 To add a new batch of coupon codes, click on the ‘Add New’ button and add new codes (one per line). You can simply paste a spreadsheet column containing all the codes. These should be unique, single use coupon codes so as to avoid fraud by users who haven't earned the coupon code. If you try to paste the same code repeatedly, the system will reject the duplicates and accept only the unique ones. In case there are no more codes to give out the reward option pauses automatically.